See our contact information below! "like" our page and it will appear on your newsfeed! click on the "F" logo below! 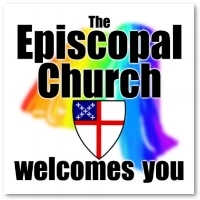 Welcome to St. John the Baptist Episcopal Church in Breckenridge, Colorado! Are you a first-time visitor, or a long-time member? Are you a far-flung friend who visits the High Rockies seasonally, or a Summit County local? Are you a Jesus follower, or are you still seeking deeper meaning wherever it may be found? No matter who you are, where you are from, or where you might be on your life's journey, you'll find good company here with fellow pilgrims and searchers on the way! This place is holy. This place is fun. I love this church, and I think you might too! This church is named after our patron saint, John the Baptist, that crazy, living-on-the-edge zealot who pointed to Jesus and said, "This guy is the real deal. He loves God. He loves all people. Follow him!" And so we do, trying our very best, with God's grace, to be a welcoming community practicing hospitality, spirituality, and service - in short, embodying the love of God. There are many ways to embody the love of God, our neighbor, and our selves. And we hope you'll find that sweet spot that both challenges and nourishes you, and others you meet along the way. Life is an adventure! Jump in with us! Easter & Early Spring Blessings! every Tuesday evening from 6:00 to 7:00 p.m.! All of us at St. John the Baptist are glad that you are here! St. John's is a place where we encourage and enjoy each other on our life journey. We seek God’s call in our lives - as individuals and as as a community. We have learned that we can’t fully become who Christ invites us to be without being a part of a faith community. Please join us for Adult Ed programs most Sunday mornings from 9:30 to 10:15 a.m. ("between the services") in the Parish Hall. St. John's is a welcoming community centered in Christ and practicing hospitality, spirituality, and service.